Want this item the sooner the better? It can be delivered to you within 2-3 days within UK. See delivery details. 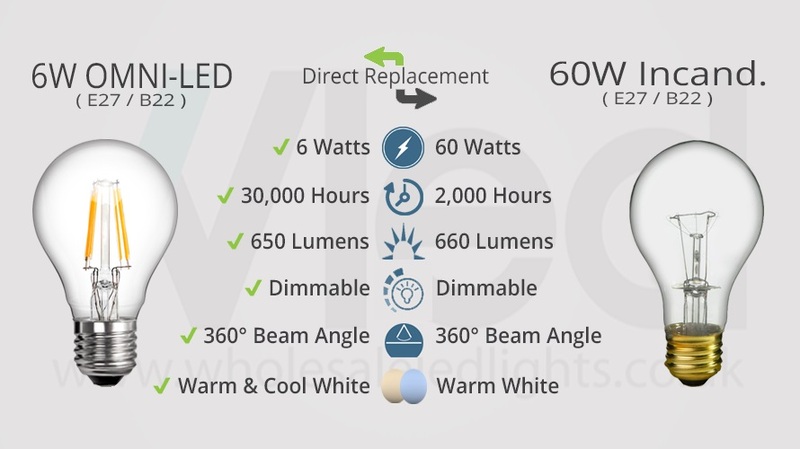 Replacing your 60W incandescent bulbs has never been an easier choice. With a power consumption of just 6 watts and with new OMNI-LED technology, the Mirrorstone dimmable B22 6W OMNI-LED Clear Globe bulb will replace them effortlessly. Retro fitting into your existing light fittings with a standard B22 base, you can get swap them straight over with you existing bulbs and start making savings of up to 90% promptly. Additionally to this, you can get an additional 5% saving on any order where you bulk buy 5 or more. Check out the video below to find more about this B22 bulb. You can also use the separate offer of our consistently ran discount codes to get up to another 20% off of the sale price. These two offers can be used collectively to get up to 25% discount off of the sale price! With our OMNIPlus range of LED bulbs, you’ll be getting a more efficient, brighter bulb that outperforms our previous range by far. An improved aluminium heat sink means an even greater lifespan, so your lighting will shine for longer. Join the next generation of eco-friendly saving and upgrade today. All the 6W OMNI-LED Globes incorporate 4 singular LED filaments. These high power filaments emit a bright light output along with a clear glass finish to fully replicate the look of a 60w incandescent light bulb. The previously mentioned LED filaments achieve a light output of 650 Lumens and complete 360° spread of light. Along with the high brightness and spread of light, like our full range of B22s, you also have the option of 2 different colour variations, Warm White (3000K) and Cool White (6000K). When looking at the colour to install, Warm White is recommended for any rooms that have a more traditional style and decor to them. Warm White is also recommended for bedrooms and hallways as well as living areas like living rooms and dining rooms. Opposite to Warm White, the Cool White is recommended for rooms which require a sharper, clear white and rooms with a more modern styling. Cool White's also recommended for installation within bathrooms and kitchens. If you aren't sure what colour to chose then read our guide on LED colour for more information. It has an estimated life expectancy of 30,000 hours that is equivalent to over 10 years assuming an average daily lighting time of 8 hours. Available in a range of E27, E14, B22 & B15, brand new OMNI-LED technology allows LEDs to achieve a lighting effect closer to incandescent lights than ever before. When LED light bulbs were first introduced, they featured an array of SMD LEDs. Whilst as bright, the SMD light bulbs could only achieve a 180° beam angle due to the nature which they are manufactured. Whilst useful in LED spotlights, it wasn't as useful in LED light bulbs. New OMNI-LED filament technology allows the bulb to get an effect which is as close to an incandescent light bulb than any LED before. This is achieved by the omnidirectional 360° spread of light that is achieved from the filaments. A smaller range of our OMNI-LED light bulbs are also available as dimmable. Whilst it is not necessary for them to be dimmed, there is the option to create a range of moods all from your one bulb. If you do want to dim them, along with all LEDs, then you will have to install a compatible LED dimmer switch. We only guarantee that the Varilight V-Pro or V-Com range of switches will work with our bulbs. You can find equivalent Low Load Trailing Edge dimmer switches but as they haven't been fully tried and tested like the Varilight ranges we cannot guarantee that they will be compatible. We have answered FAQs on dimming LEDs and the importance of the changing your switches. Our full range of Mirrorstone Lighting products come with a standard 2 year manufacturer's warranty. The warranty on LED spotlights, LED light bulbs and LED tape can also be extended to up to 5 years, free of charge. If you have any queries about OMNI-LED range, Varilight dimmer switches, our wholesale prices, trade offers or anything else then please feel free to contact us on 0116 321 4120 or by e-mail on cs@wled.co.uk. It was in the wrong box and not dimmable. Lies. Lies. Lies. Very good light achieved with these bulbs. At one point on dimming they flicker, but it is easily moved above or below that point.